After making a handle for my TWCA Cam, I thought I’d better protect the cutting edge before it gets dinged so I sketched out a number of designs and this was the one I chose to take forward. It is made from an offcut of sapele with a little bit of beech for the toggle. I drew out my design on two faces of the sapele and used my 3/4” pig sticker to chop the mortise. It was a bit different to a standard mortise because as you can see it has a rounded bottom (don’t we all). Then I sawed out the basic shape and used my rasps and carving knife to refine it further. Next I whittled the beech toggle, sanded everything to P240 and drilled two counter-bored holes in the cover and one in the toggle. The finish is one coat of BLO and one coat of Briwax. Some knotted 3mm elastic secures the toggle to the cover. The photos show how the toggle holds the elastic in tension thus securing the stem of the iron in the slot. In use it is very secure and affords a good deal of protection. That’s a work of art in itself! Wow Andy, nice job! Wow, ingenious Andy and beautiful to boot. 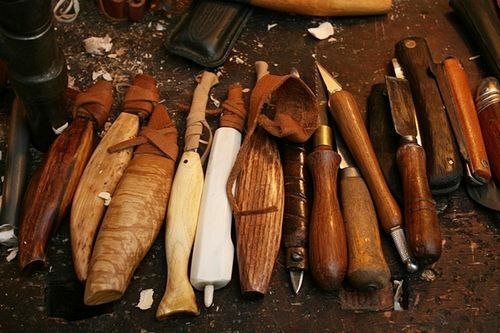 Next up, a custom cover for all of your carving tools? + 1 to Smitty and Duck; artistic genius! So very clever and beautiful, the Bauhaus would be proud of you. A work of art containing a work of art. Nicely done Andy. Yeah, that’s pretty much the best thing I’ve seen in a while. Well done. Thanks fellas. It was an interesting little project. Funnily enough when I restored my 3/4” pig sticker, I never thought for one second that I’d ever actually use it. It worked well. Fine work on that cover, now they are a pair. Thats a really personal version. I don’t even sew leather sheaths anymore, have become so happy for the simple wrapping, that I use that now. It is fast in use and takes a second to make. Just a long piece of leather or inner tube from a car or bicycle, cut in app 2 cm one end down to a mm in the other end. Put your finger under in the last wrap and stick the end through. Nothing wrong with that Mads. That’s a lovely array of knives you have there. That fine tool deserves to be protected. Nice work and congratulations. Nice to see your still working the Sapele Andy! beautiful work and like the innovative toggle latch.